Sen. Lisa Murkowski speaks on the Senate floor during the debate on the GOP tax bill on Dec. 19, 2017. The Alaska Federation of Natives, a group that was a critical part of U.S. Sen. Lisa Murkowski’s 2010 write-in victory, announced on Wednesday that it is “strongly opposing” the nomination of Brett Kavanaugh to the U.S. Supreme Court. The announcement comes as Senate Republicans are attempting to quickly confirm the conservative judge to the court ahead of midterm elections. Murkowski, a moderate who’s been tight-lipped about her assessment of President Donald Trump’s pick, is one of the two key Republicans votes Kavanaugh opponents are focusing pressure on. Progressives have been raising the alarm bells on Kavanaugh on everything from reproductive rights and health care to presidential powers and climate change, but in the recent weeks there’s been heightened attention on Kavanaugh’s record when it comes to Alaska Natives and Indian Country. Among the committee confidential emails released by Senate Democrats last week was one by Kavanaugh that questioned the constitutionality of any programs for Native Hawaiians. The announcement focused on three areas of concern with Kavanaugh: the Indian Commerce Clause, the special trust relationship between tribes and the federal government, and the political classification doctrine that focuses on tribal membership rather than ancestry. Each area, AFN writes, could pose significant problems for Alaska Natives. For example, Kavanaugh’s record suggests that he has a narrow view of the Indian Commerce Clause, restricting the law’s application to issues solely around trade. Justice Clarence Thomas holds a similar view, and argued against the Indian Child Welfare Act because it wasn’t strictly a trade issue. Kavanaugh’s also argued against the special trust relationship with Native Hawaiians, arguing that they shouldn’t qualify for the same protections as Lower 48 tribes because they didn’t go through the same things that Lower 48 tribes did. AFN argues the same troubled thinking could be extended to Alaska and pose a constitutional threat to the Alaska Native Claims Settlement Act. The Huffington Post zeroed in on the weight the Alaska Native community could bring to bear on Murkowski’s decision in a story last week, noting that Alaska Natives could gain the senator’s attention in a way progressives may not. 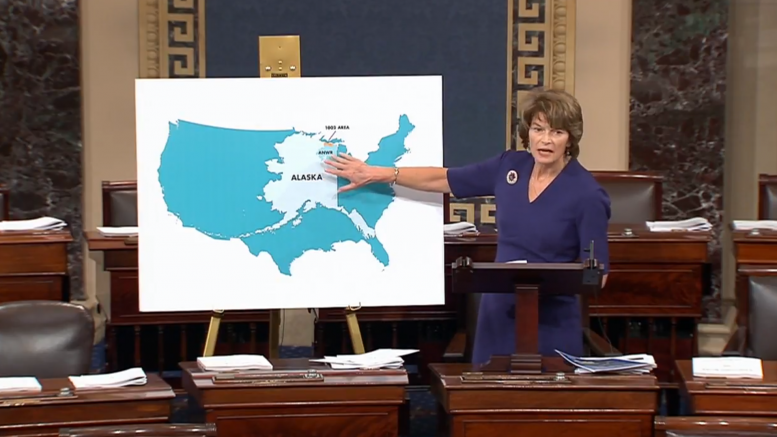 “If the Alaska Native community raises its decibel level on matters from subsistence to civil rights, that would register with Sen. Murkowski,” an unnamed source familiar with Murkowski told the Huffington Post. Murkowski and Maine Sen. Susan Collins complained about the knee-jerk opposition that Democrats mounted against Kavanaugh, arguing for a measured and “exacting” review of Kavanaugh’s record. AFN’s news release explains they took that same measured approach. AFN is Alaska’s largest and oldest Native organization. Its membership includes 186 federally recognized tribes as well as village corporations, regional corporations and regional non-profit organizations. Alaska U.S. Sen. Dan Sullivan is already on board with Kavanaugh’s confirmation, a position that he announced just three days after Trump announced his nomination and well before any of the Senate nomination process began. Be the first to comment on "The pressure’s on Murkowski after the Alaska Federation of Natives declares opposition to Kavanaugh"